Preston’s premiere food and drink market returns to the streets of Friargate and Orchard Street during the summer holidays. 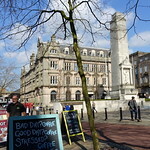 Lancashire Market is booked in for Saturday 22 August and the usual mix of cupcakes, coffee, pizzas and pies mean sweet-tasting smells will drift up into the city centre. Organised by Preston Business Improvement District the market has more than 50 stalls stretching the length of Friargate. Already signed up are Shirley’s Pies, Cupcakes by Sofia, Leagrams Organic Dairy, Lytham Coffee and Wetheroak Farm.